Modified and upgraded 126 389 times. This site was created by a small group of fountain pen enthusiasts, as a virtual notebook where to collect and share information about fountain pens. The site is based on the MediaWiki software, the same used by the far more famous WikiPedia. The license used for all the site contents (for more information see Project:Copyright) is the GFDL, the same license used by WikiPedia. This means that the information you find on this site is available to anyone and can be reused freely, with the only condition that this freedom must be maintained: this simply means that whether you use the content of this site on your work, that work must also remain free and be released under the same license. Although the begin of writing instruments history is lost in the mists of time, the fountain pen has no more than two centuries. Although there are traces of reservoir pens up from the tenth century,  when the sultan of Egypt commissioned a pen that should not make stains on hands and clothes (which is still continues to happen) and was brought a pen with a tank, forerunner of modern fountain pens. But the first examples at least partially functioning fountain pens are dating approximately to the half of 1800, and only at the beginning of last century the fountain pens has actually become a reliable writing instrument. For many centuries in fact the main writing instrument was the goose pen, until the use of metal nibs began to spread in mid of nineteenth century. Although they were an important innovation, metal nibs presented the inconvenience of the need of a continuous ink retip. For this reason, in the era of the industrial revolution, people began almost immediately to try to equip the nibs of some form of tank to solve this problem. These first attempts, however, always worked in an occasional and poor reliability. 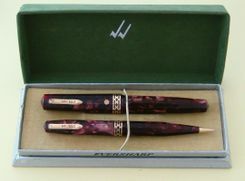 There are various precursors of what today is called a fountain pen, the most important of which, the first for which a patent is known (dated May 25, 1827) is probably the one created by Petrache Poenaru for a portable pen supplied with a sort of cartridge consists of a cylinder made from a quill pen. These first attempts, however, never knew a big spread, probably because their functioning still not reliable enough. Therefore, despite the existence of various precursors, many people set the birth date of the modern fountain pen in 1883, when Lewis Edson Waterman, with the invention of the multichannel feeder, began the production of what is considered to be the first truly functional and reliable pen. This is only a partial truth, because many other functional fountain pens were produced at that same time, but is true that the Waterman invention was an important improvement, as well its contribution to the industrialization of production. Since then the fountain pen experienced a period of great improvements, in the materials, in the filling systems, and also in style and design. 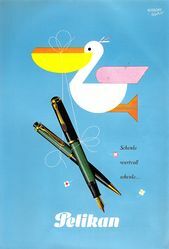 In particular the period between the '20s and '50s is considered to be the golden age of fountain pens. Starting from the '60s, with the pervasive diffusion of cheap ballpens, the use of fountain pens has been decreasing. Today we assist to a new peak of interest in fountain pens because they had the characteristic of being very personal objects, capable to give uniqueness and distinction to any people writing. ↑ as reported in the article A history of pen showing the translation of an Egyptian document around 969. The working principle of a fountain pen is related to a complex balance of different forces that make possible that just the light pressure of nib on the paper can make the ink reach the sheet from the reservoir, without leaking when the pen is not used. A fountain pen should not be used in vertical position, but the nib should be put on the paper so that the lower tip of the nib smears on it. The great advantage of a fountain pen over a ballpoint pen or a roller (that must be used vertically) is that this kind of use allows you to write using very different writing angles, while taking an hand position that is much more natural (you just let the pen go between thumb and index). In addition, the fingers (held between thumb and index, using the medium as an additional point of support) must be used to move the pen when writing, and not to hold it. Finally, a properly functioning fountain pen does not require any pressure to write, the weight of the pen must be sufficient to start writing. The use of pressure can be used instead to open more or less (depending on its flexibility) the tines of the nib, allowing you to vary the tract size, and thus having a writing result that is a lot more personal. All these characteristics make writing with a fountain pen much more convenient and comfortable than with any other type of pen, allowing much longer and less laborious writing sessions. For these reasons, even today, despite the presence of so many alternative technologies, the fountain pen is considered by people that do a lot of writing (writers, amateurs, enthusiasts) as the best tool to write and draw marks on a paper sheet. We give many thanks to Truelite Srl a free software company specialized in Linux and open source consulting and development, that offered the hosting of these pages on their server, along with the use of Mediawiki and PHPbb software, and all the computational and storage resources used by them. We also thanks people of Casa della Stilografica an historical writing instrument shop located in Florence, specialized on fountain pens. For more than 50 years it has been a collector and enthusiasts gathering place, and also it was the place where the idea of this site was born. They also contributed borrowing us some rare books, that have been one of the most important sources for the information written on this site. This page was last edited on 19 December 2018, at 23:55.